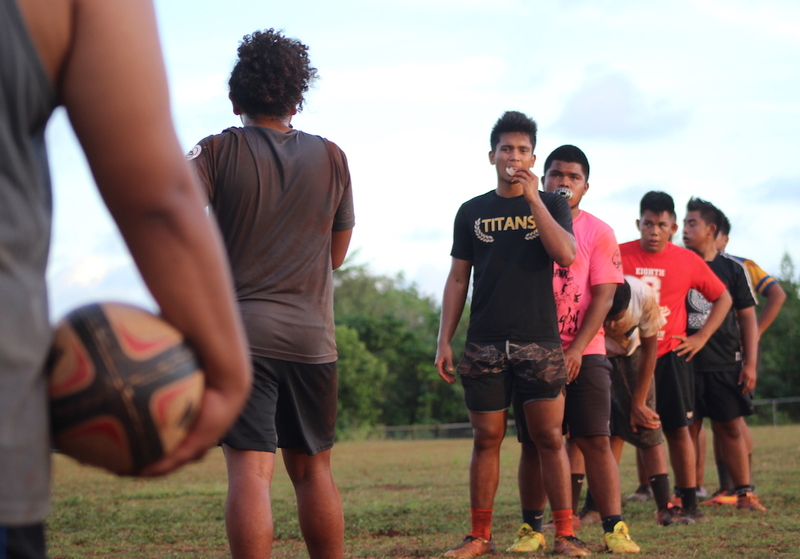 The Sanchez Sharks boys rugby team always seems to fill the underdog role of the IIAAG. With multiple top three finishes in the past decade, which included titles in 2007 and 2013, the Sharks have been swimming under the sonar to casual fans of the sport, despite turning some impressive seasons. Sanchez finished 3rd place in 2017 and 2018 has the Sharks sitting as a strong second seed with a near victory over the three-time defending champion FD Friars. The Sharks are gearing up for a playoff run, which begins this Tuesday, in hopes to bring a rugby cup back to Sanchez with the season set to conclude this Saturday. But despite how the Sharks finish the 2018 season, the program is making waves for future success. IIAAG Rugby has seen its fair share of the Friars and Geckos as the two schools have had an exclusive battle in the past four rugby championship games while the Sharks have been battling for bowls. While wading in the outside waters, the Sharks have been a consistent source of gritty rugby competition under the tutelage of head coach Ron Ruiz, who’s been coaching Sanchez since 2008. What keeps Ruiz coming back is a sense of giving back to the community. “I had coaches back home in Hawaii that helped me do a lot. If it wasn’t for them then I probably wouldn’t have stayed in school. They kept my head straight and always told me that hopefully I’d go on with that tradition. It’s something I enjoy doing and my wife gives back to the community being a Chamorro practitioner, and it really brings us joy to give back,” said Ruiz on what keeps him around. Ruiz, a pioneer for Guam paddling, is an ‘old school’ coach who prioritizes conditioning and defense. “If you’re conditioned then you will last and be in the game. I work my kids on rucking and tackling. Good defense presents good offensive opportunities. If you press on defense and rush as a team, you always present an opportunity on offense. If the game is close, you’re always going to have a chance. The Sanchez boys have really bought into that system,” added Ruiz. In 2017, Ruiz added a pair of Guam National Rugby members to his coaching staff in FD Friar alumni Chris Sgro and Joseph Mateo. Both Ruiz and the Sharks players agree that Sgro and Mateo have added a certain level of finesse to their style of rugby, like teaching a Shark how to eat using utensils. “I’ve helped tune the boys passing and just overall mindset to how they look at the game. Rugby may seem like an organized chaos, but there definitely is a structure to it, like when to kick or when make wide passes. [Joe] and myself have just been able to expand on those things and a lot of it comes through our experiences since being on the National Team,” added Sgro. Sgro’s first stint as a coach was back in 2012 when girls rugby changed from flag to tackle. He continued to coach until 2014 with Christine Calvo while his younger sister was playing for the Cougars. Sgro moved on to officiating from 2013-2016 before joining the program in 2017. “I’ve always wanted to give back to the rugby community on a personal level. I’ve always been familiar with [Ruiz] and I got see how all the schools play while refereeing. I felt Sanchez was a perfect fit for me because they have always had a good structure. I give a lot of credit to Ron for allowing me to come in and try to implement things as the season goes on,” said Sgro. Being an alumni of FD and having played for the school when rugby was first incorporated in 2005, Chris has had to line up his Sharks against his school colors for the past two years. As strong as the Alumni Pride is, working to improve the overall sport as a Shark coach is Sgro’s main focus. Sanchez has become a strong team with a wealth of their roster being under class-men. The two senior team captains in Jake Uncangco and Willie Booker joined the team in their junior years in 2017. They gained a lot of confidence from the other upper class-men and they want to reciprocate those feelings. “Our seniors last year really pushed us to get better. I was a new guy on the team, but they gave me a lot of confidence despite that. I can’t say if our confidence is any stronger or better this year, but it stems from last season. As a captain this year I have to help everyone do their part,” said Uncangco. The most lethal Shark on the squad stands tall in the build of Booker. He’s well aware that he often gets doubled and teams prepare for him when they hit the field. Knowing that only gives Booker a greater will to bring his best. “I just have to step up my game. If I work hard in practice then it’ll be easier for me to handle during the games,” said Booker. The addition of Sgro and Mateo has resonated well with the players. With the numbers not as fruitful, the players have found ways to still be successful while playing iron-man style. “Sanchez is a small team so we have to know how to grind. Adding finesse to the style of defense we play is a big help from coach Chris,” added Booker. The hungry Sharks have shifted focus to the playoffs where the 2018 title is in their grasps. “Winning a title is very important to us. We want to stop the losing streak,” said Booker. “We had a good season, but I keep telling these boys that we can’t take any team lightly. We have to bring the same intensity that we brought when we faced FD,” added Jake.